A Ku Klux Klan Imperial Grand Wizard called last Sunday’s shooting spree by white supremacist Frazier Glenn Cross a setback for the organization, CNN reports. 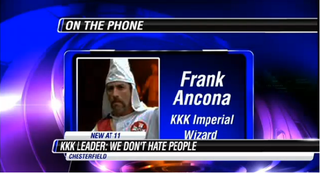 Frank Ancona, who leads the Traditionalist American Knights of the Ku Klux Klan and other self-professed hate group leaders, denounced the shootings at two Jewish institutions in suburban Kansas City, Kan., during interviews with USA Today and CNN affiliate WDAF in Kansas City, Missouri. "I believe in racial separation but it doesn't have to be violent," he told CNN after they tracked down via his Twitter account, where he has 840 followers. "People in the Klan are professional people, business people, working types. We are a legitimate organization." In short, Ancona says, Cross, who founded the Carolina Knights of the KKK in the 1980s, went "rogue." Seventy-three-year-old Cross went on a rampage at two Jewish institutions in suburban Kansas City last Sunday, shooting and killing three people, including a teenage boy and his grandfather, and a woman who worked with visually impaired children. He was charged with capital murder and first-degree premeditated murder. He did not enter a plea at his first court appearance, CNN reports. He requested a court appointed attorney and is scheduled to be back in court later this month. Ancona, who lives in Missouri, told CNN, "there's a new Klan for modern times—a Klan that's 'about educating people to our ideas and getting people to see our point of view to … help change things.' "
He told CNN that he and those like him can spread that message without violence—a sort of rebranding of the Klan.